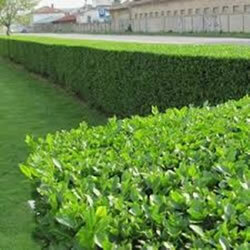 Green Privet is one of the most popular evergreen garden hedges - these are top graded certified field grown plants. Green Privet are a long time favourite for a quick growing evergreen hedge and these 3ft plants will form a lovely hedge after one season in your garden. These are the perfect size to transplant into your garden - we will also email you our free guide to hedges and planting. They do not require good soil and will quickly make a dense hedge which will grow up to about 3 metres if required. Can be planted in full sun or partial shade.he plants we are offering are field grown plants and are the ideal size for planting out and will get established quickly. You plant as a single or staggered row at the rate of 5 per metre, so 25 will do up to 5 metres!